Well, I’m back! I finally finished my exams and applied to university so now I’m free to share some delicious recipes. I baked a cake to celebrate the fact that I finished. Below is the cake. I think I need to work on my introductions. Anyhow, this cake is pretty good at doing cake things. It’s moist, which is good, and it’s fluffy, which is also good. I mean, can you ever have too much fluffy? The cake, however, does not do people things very well. For example, the cake is not a great air conditioner repairman. In fact, if you put the cake on an air conditioner, the cake might fall into the essentially giant food processor. I wonder if large bakeries could make cake pops using air conditioners. The cake would be processed into chunks, and the smell of cake would fill up the bakery. Maybe little pieces of cake would fall from the ceiling as a treat to all the customers waiting in line. Free samples via air conditioner. The cake isn’t a very good stuntman either. The cake just sits there. The only stunt it can perform is being chopped into pieces and eaten alive. Which, while tasty, is hardly realistic. It bleeds whipped cream! The cake performs its responsibilities as a cake fairly well, but it doesn’t do other things. I feel though that it’s almost inappropriate to expect so much from a mere cake. After all, it is vanilla. I would have liked it though if when I needed a photograph it would cooperate. I asked it to smile, and it just sat there and then rolled over on its side (as pictured). 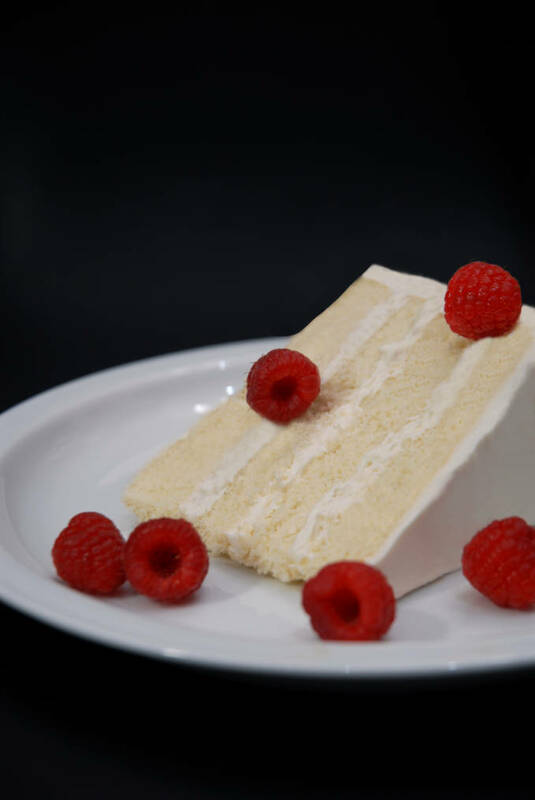 Fluffy vanilla cake frosted with whipped cream and topped with fresh raspberries. Recipe from Sweetapolita. Preheat oven to 350°F (180°C). Grease, line with parchment, and flour four round 8-inch pans (you can also use two to make two layers). In a medium bowl or measuring cup, combine and stir the egg whites, ¼ cup of milk, and the vanilla. Set aside. In the bowl of an electric mixer fitted with the paddle attachment, combine the dry ingredients together on low speed. Add the butter and remaining milk, and mix on low speed until just moistened. Increase to medium speed and mix for 1-1/2 minutes. Scrape the sides of the bowl and begin to add the egg mixture in 3 separate batches; beat on medium speed for 20 seconds after each addition. Divide the batter in four, spreading it evenly with a small offset palette knife. If you have a kitchen scale, weigh to ensure four even layers. Bake 15-20 minutes or until a cake tester comes clean when inserted into the center (you do not want the top of the cake to brown at all or the cake will be dry). Do not check the cake before 15 minutes. Let cool on racks for 10 minutes before loosening the sides with a small metal spatula, and invert onto greased wire racks. Gently turn cakes back up, so the tops are up and cool completely. Wrap tightly and store at room temperature for up to 2 days, refrigerator for up to 5 days, or frozen for up to 2 months. Best eaten the same day as baked. Whip all the ingredients until stiff peaks form. Spread a cup of whipped cream on a layer of cake. Place another layer on top and spread more whipped cream on it. Repeat with the remaining layers. Use all the remaining whipped cream to cover the cake. Serve with raspberries. Heheheee you’re hilarious. This cake looks like it does an amazing job of being a cake. It’s gorgeous and looks classic and delicious! Your cake is stunning, simple yet elegant! Those Prima Donna cakes are just so difficult. It should just be cake. Period. Do you think it was annoyed because it was vanilla? There is nothing wrong with that. Particularly when said cake is a gorgeous as this one. Congrats on finishing your exams Ilan, I have my fingers crossed that you did well (of course, you don’t need it) and that you get ino the university of your choice. I went to UofT and loved it. That’s true, vanilla is excellent. I did really well, which is awesome. Can’t wait for university! I love a good vanilla cake! Yours looks so fluffy and perfect!